San Lorenzo rallied past Ferrocarril to ensure the third straight win in Group E. Gabriel Deck (199-F-95) stepped up with 26 points to lead the winners. The teams were knotted up at 30 heading into the second half. However San Lorenzo used a strong 24:15 rally in the third period to clear off for good. Marcos Mata (201-SF-86) connected for 14 points and 8 boards in the win. Franco Balbi (185-PG-89) answered with 20 points, 7 rebounds and 6 assists for Ferrocarril. 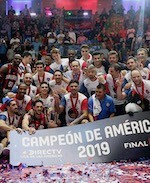 Mogi das Cruzes topped Fuerza Regia to secure the Final Four appearance. Shamell Stallworth (195-SG-80, college: USF, agency: Interperformances) produced 20 points and 6 rebounds to lead the Brazilian team. Mogi recorded a 43:33 halftime lead. Fuerza Regia held their opponents to just 32 points in the second half but could avoid the loss. Caio Silveira (211-C-87, agency: Interperformances) tallied 20 points and 11 rebounds in the victory. Jordan Glynn (200-F-89, college: SF Austin) answered with 23 points for Fuerza Regia.